The Alexandra Court Hotel is a charming Victorian House approximately 100 years old built out of Yorkshire Lime and Sand Stone keeping all of its original Victorian features. 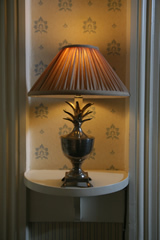 The Hotel is situated on a quiet tree lined road close to Harrogate Conference Centre and has ample off street parking. For the last 25 years this charming and well established Hotel has been owned and ran by the Keeler family. We offer 11 luxury en-suite rooms with all up-to-date facilities. All bedrooms are elegantly furnished and individually decorated.